Sophiafloros, Author at The BEST prices in Australia for high quality travertine stone tiles! Travertine stone is the most popular choice for pool coping, pavers and tiles around the world. It has a many benefits such as it’s timeless look, it feels amazing underfoot, is incredibly durable, easy to clean and more! As Australians, we love the great outdoors. As a result, we typically spend much of our spare time in relaxing in nature or having a catch up with mates in our backyards around the barbecue. If you’re lucky enough to own a pool, it is the centerpiece of your outdoor area. It is your private relaxing retreat as well as an inviting gathering spot for all your friends and family to make memories. Why Should I Choose Travertine? There are a multitude of options with choosing tiles and pool coping. There are many stone options and decking options to choose from, but before you get overwhelmed with the myriad of choices, you will ultimately come back to travertine. There are many reasons you should choose travertine over any other stone or decking option. Travertine has a naturally cooler touch than any other paving stone. As a result, travertine pool coping is a more practical choice when you and your family are enjoying the summer months outdoors. Typically, most people want to enjoy their pool and outdoor area more when the weather is warmer. Imagine the unpleasant experience of trying to climb out of a pool and have to grip your hands onto the piping hot pool coping. Then to quickly make your way on bare feet across what feels like hot coals on your bare feet. Ouch! These unpleasant experiences will be drastically reduced if you install travertine tiles and pool coping. That’s why it makes sense to choose travertine pool coping over any other stone or paving material. When travertine tiles and pavers are made, there are less man made processes involved compared with other stone options. The stone is harvested naturally from hot springs with minimal processing. Therefore, travertine is a great choice to reduce your environmental footprint as well as bringing natural beauty to your pool area and surrounds. Travertine stone has natural grip. This is important to consider especially if you have elderly people or children likely to be around your pool area. Prevent unnecessary slips and falls with the practical high slip resistance by installing travertine pavers and pool coping around your pool area. In addition, with travertine pool coping, having the extra grip makes it easy to enter and exit your pool and spa. Also, compared to any other paving stones or materials, travertine tiles and pool coping absorb the most water. As a result, this means that there are less puddles and water resting on the surface of the tiles compared with other stone options. Travertine pool coping and tiles are extremely strong and weather resistant. You won’t need to worry about them if they experience heat waves or drastic jumps in temperature. You also won’t need to maintain them as often as other paving and pool coping materials. Travertine stone is extremely hardy and stong. Also, other stone tiles tend to experience colour fading over time, making the entire pool area and surrounds look weathered. With travertine, you will not experience this. The colour you bought your travertine will stay the same. It is no doubt that choosing travertine tiles and pool coping is a smart decision to last the test of time. 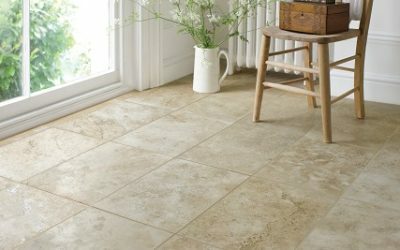 What are the best indoor travertine tiles? If you have any questions or need advice, give us a call. We’re available Mon – Fri (7.30am-5pm) and Sat (9am-5pm). Otherwise, feel free to drop us an email and we will get back to you as soon as possible. Famous for the best quality travertine tiles and pool coping at the best prices! OUR PRICES WON’T BE BEATEN! Our great reputation is because we deliver quality travertine at the best prices. Please let us know if you happen to find a better price and we’ll beat it! Express shipped anywhere in Australia! At Travertine Tiles Warehouse, we have a large array of travertine pool tiles and pool coping. Travertine tiles and pool coping is universally a very popular choice. It has a timeless appeal, easy to clean, feels amazing on bare feet and there are heaps of colours and styles to choose from! There are many reasons why people choose to have a pool. Consider how you and/or your guests should feel when they enter your pool area once you’ve completed your renovation. For example, you may prefer a casual and relaxing oasis, an exotic Balinese retreat, a sleek sophisticated minimalist look or an impressive grand Versace style villa? This will then determine what type of travertine tiles and pool coping will work better to serve your goal. Is your pool uncovered and facing west? It may be a good idea to choose light travertines tile to help repel excess heat from the afternoon sun. However, you may not want to go too light because it may create a reflection with the sun. The positioning and external factors surrounding your pool will make a difference to how you use your pool area. You don’t want to install your pool, tiles and pool coping and realise this when it’s too late! Consider your lighting and furniture as well if you have an indoor pool. Is your swimming pool aqua, teal or green? Once you’re aware of this, it will help you to choose the right stone tiles to enhance the look of your pool. 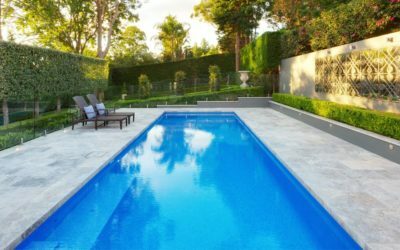 For example, if your pool is dark blue in colour, you may choose a lighter coloured tile such as Light Ivory Travertine Tiles, to create a contrasting effect. Your pool has to be paired with the travertine tiles you choose. Together, they will set the scene for creating your pool area. While everyone has their own individual tastes, there is almost always a stone tile that resonates with someone. There are thousands of stones to choose from. Travertine tiles have a universal appeal because of it’s warm tones and range of both dramatic and subdued tones. While some stone tiles such as marble, granite and quartz require a little more care. In the long run, stone tiles are a great investment due to their strength. However, with the right maintenance, any stone can last forever. If you choose a very porous stone tile, make sure you seal it properly. As a result, we love selling travertine tiles because they are have an undeniable strength and appeal that is unmatched. Travertine tiles are also a great choice for outdoors because they can easily survive extreme leaps in temperature. It’s no surprise, that the Colosseum (which is made completely from travertine stone), has lasted thousands of years! No two stones are the same. Even travertine tiles from the same quarry have different characteristics and attributes from each other. With natural stone tiles, you hold a unique part of nature in your home. Each piece has an individual quality and personality that can’t be replicated. As a result, every stone piece tells a story of how it has been created and molded from the earth. Natural stone has formed naturally from the earth that has a greater appeal rather than a lifeless conventional replica tile. Own a piece of the nature with the ever elegant natural stone tiles. Many geologists and other stone enthusiasts believe that stone holds an energy. Many people believe that a stone has a personality and mood that can provide positive natural vibes if you’re in close proximity to it. Natural stone tiles have an unbeatable elegance and timelessness about them. Stone tiles are also extremely versatile. This means you can use stone tiles for indoors for your floor, stone splashback, stone feature wall and stone fireplace. Outdoors, stone tiles are practical and look amazing for your patio tiles, pool coping, stone paths and driveways. Travertine tiles are a great option for your indoor tiling. This is because they have are strong, have a universal appeal, add warmth, add a luxurious stone texture and aren’t as visually obstructive as other stones. Travertine tiles will instantly give your interior design a lift and enhance the space around it. There are many sizes, colours, textures and finished to choose from. If you want to incorporate travertine tiles in your interior space, we recommend choosing honed and filled tiles. Honed and filled travertine is when the holes and voids typical in travertine stone are filled. Therefore, this creates a smooth, flat surface which makes it easy to sweep clean and mop. Travertine tiles look amazing in kitchen floors, splashbacks, bathroom floors, family rooms and dining room tiling. As well as using travertine tiles indoors, you can create a seamless look by continuing the look in your outdoor area with travertine outdoor tiles. Side view of this stunning travertine home for a local stone seller. Iranian architectural CAAT Studio, created a cutting edge architectural marvel with travertine. The client is a local stone seller and cutter. So, the house was made as a celebration of the beauty of travertine stone. 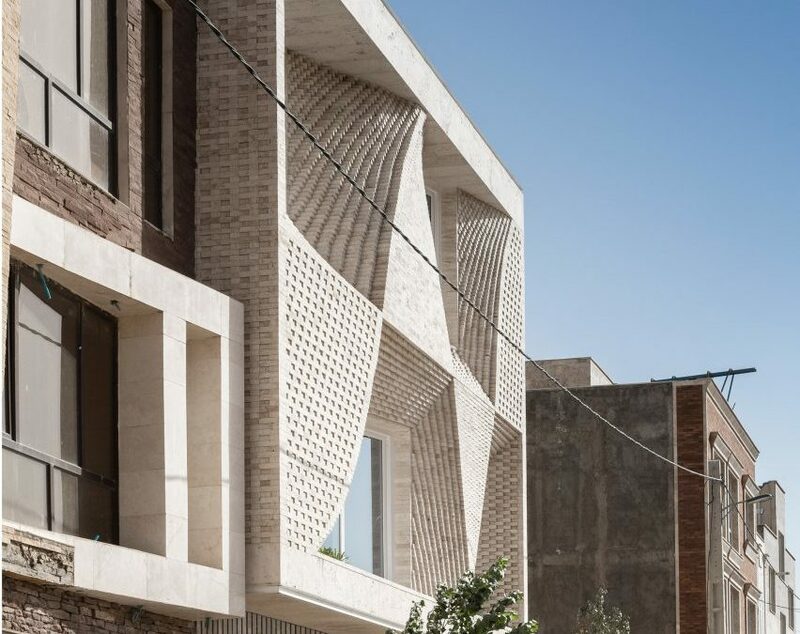 As a result, the whole house is covered with solid travertine bricks arranged in an eye-catching wave-like pattern. These bold structural spacial divisions of the travertine bricks create rhombus-shaped curtains embracing the windows. The cascading positioned travertine bricks create interesting patterns with contrasting shadows on the exterior of the house. Travertine was chosen in this house design because the client wanted to showcase the beauty of the stone as well as show off his trade as a local stone seller and stone cutter. Travertine also provided the house with strength, light and ventilation. Additionally, it was easily available from the two large travertine quarries (Hajiabad and Abbasabad). The client’s house is located in a town surrounded by mountains called Mahallat (262km south-west of Tehran). This region is known for being rich in travertine stone with two quarries located nearby. This arrangement creates a striking contrast with light and shadows with alternating voids creating a stunning display of depth and dimension reflecting from the hot, arid climate of the region. The front entrance of this beautiful house made almost entirely of travertine stone. At the base of the house, where the garage is situated, vertical sections of travertine scale up to the second level. Each travertine piece was cut in L-shaped pieces to reduce the weight of the stone. With a focus on sustainability, nothing was put to waste, with the left over travertine stone being used to fill parts of the walls. Each window was positioned to get the best vantage point of the surrounding mountains. The project started with purchasing a simple box-shaped house. The goal was to utilise the amazing views of the quarries, a local copper mine and the surrounding mountains. Therefore, the position of the windows was decided based on creating the best possible views. The walls, ceiling and floors run seamlessly together as though they are made from one piece. Organically, the walls ‘flow’ from one window to another creating a wave-like appearance. In addition to this aesthetically pleasing house, this travertine house proved to be an economical and environmentally friendly project.